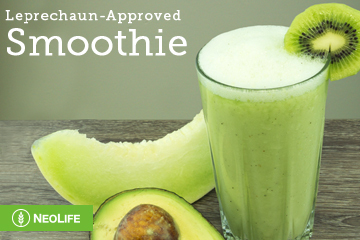 In honor of St. Patrick’s Day, we’ve crafted this Leprechaun-approved, Kiwi Melon Smoothie. This refreshing smoothie packs all the nutrition with no artificial anything so you and your family can enjoy – worry free! Combine all ingredients in blender. Blend until smooth. Garnish with additional kiwi as desired and enjoy! Go to NeoLife.com for more info. Sip on this Girl Scout Cookie-Inspired Smoothie!